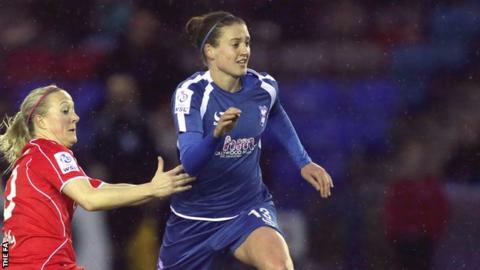 Midfielder Jade Moore says Birmingham City are using Liverpool as their Women's Super League title inspiration. Last season Blues finished a point adrift of champions Liverpool, who had collected just six points before the mid-season break. Birmingham, who led at the midway point last term, have two points from their opening three league games in 2015. "All I do is look at what Liverpool did, it shows how up and down it can be," Moore told BBC Sport. "Last season we were a prime example of getting points on the board early and having that sustain us. "But, while it can beep you up there, you are not going to win the league unless you perform at the end when it really matters." While England international Moore admits the injury-hit Blues find themselves "in a rut", having been knocked out of the FA Cup and as they continue to look for their first league win of the season, she insists Birmingham's title hopes will be boosted by the early difficulties. Despite Moore joining fellow England international Karen Carney and junior internationals Kirsty Linnett and Chelsea Weston on the sidelines - and with Young Player of the Year nominee Freda Ayisi suspended - Blues secured a point against Notts County on Sunday. England international Karen Carney, who was the first woman inducted into Birmingham City's Hall of Fame, is yet to feature this season. However, last season's WSL 1 top scorer has returned to training. "We are showing our strength and depth, which is something that has been questioned in the past," Moore said. But more importantly, Moore said team-mates on the fringes of David Parker's side have seized the chance to establish themselves as first-team players. "After having the season that we did last year, when near enough the same XI performed week in and week out and really made it hard for the manager to make changes, when injuries did hit us later in the season it came down to someone being thrown in to do the job," she explained. "I was injured for the last few games and then you are asking someone to do the job that I was doing and that is not necessarily playing to their strengths. "What you have is someone filling someone else's shoes and that is not what we want or need. "Right now no one is being asked to fill a gap, we have players doing what they are good at and playing to their strengths. "We don't want players who are similar to one another, we want different qualities that will improve the squad in different ways. "Against Notts, we took a step in the right direction - we have players showing they can do the job. It is a pretty big but also a very good learning curve." Moore is optimistic about being fit to face league leaders Chelsea on Sunday and Ayisi is available after serving a three-game ban, but boss Parker said both Carney and Linnett remain a doubt.